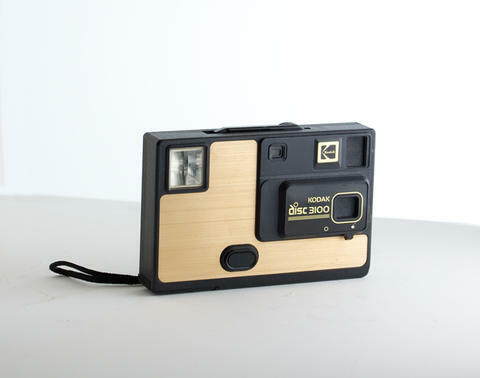 Item is a small, flat, hand-held camera with black plastic body and brushed metal, gold-coloured front plate. Intended by Kodak to replace their instamatic line of cameras, the Kodak Disc cameras were designed to be simple to use, with all automatic functions. Took Disc film, a proprietary format that made 15, 11 x 8 mm exposures; this small negative size made the resulting prints very grainy when enlarged and the camera model was not Kodak's most popular. Item has a built in flash and wrist strap. Very good. A little scuffing on the case. Donated to Ryerson University Library Special Collections by Charlotte Broome in 2007. Item is originally from the Charlotte Broome donation, accession number 2007.001. Moved to the Heritage Camera Collection in 2013.